Hand finished canvas print of an original Jan Vallance painting. The inspiration behind the original Winter Scene painting. I love walking and boating along the Macclesfield canal. I travel over quite a lot of the canal network over the year, but always return to the Macclesfield and Peak Forest canals in the winter. The scenery is some of my favourite, especially in winter when the world takes on a different character. 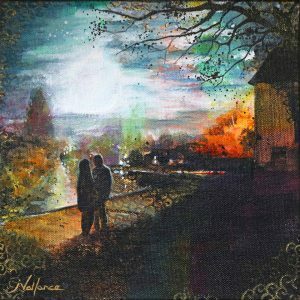 What is a hand finished canvas print? 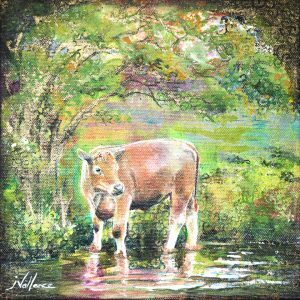 Printed on real cotton canvas, the canvas print has gold and other highlights added by hand using artist quality acrylic paints. It is then finished with varnish to protect. The colours on the screen (on my laptop anyway!) do not do justice to the actual print. I hope you enjoy this Hand finished print as much as I enjoyed making it. Hand finishing my prints means that every one is a labour of love. 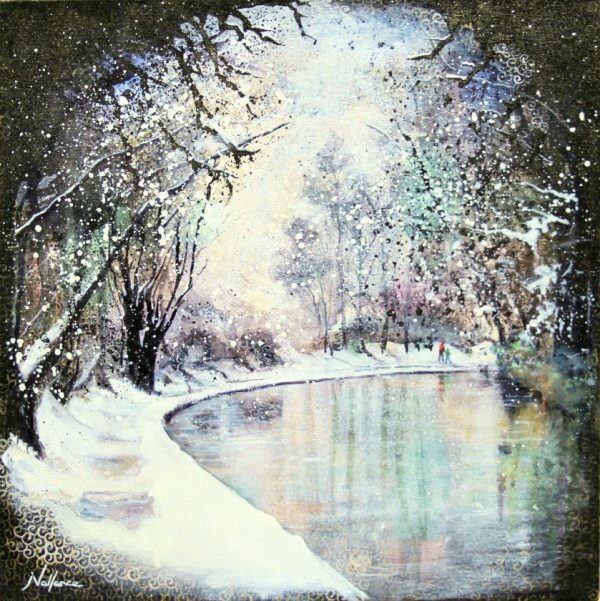 This is a print of an original painting by Jan Vallance. This print is supplied in a 12″ (30cm) or 10″ (25.5cm) mount dependant on size ordered. This print is signed on the front, below the mount. Because of the style of print this is not visible when mounted. I retain copyright on all my works. I am happy to list a handfinished print of any of the original paintings in my shop. Please contact me if you have a request. 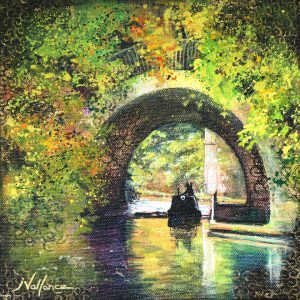 6" x 6", 7.5" x 7.5"
Hand finished Canvas Print, Tryst. Hand finished Canvas Print, Young Bull Paddling. 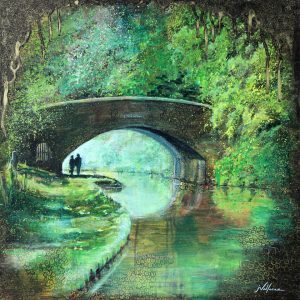 2019 – The Art Boat Tour – A Busy Year!